Carolina Chickadees are very common in woodlands and wooded urban areas of Houston throughout the year. They are inquisitive and can be remarkably tame. Their call, a fast chick-a-dee-dee-dee, is well-known to even non-birders. Carolina Chickadees are replaced in the northeast by the Black-capped Chickadees. The two species are very difficult to tell apart. 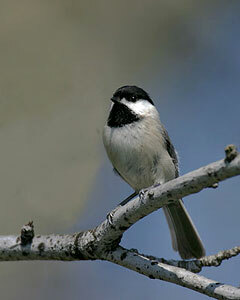 The easiest clue is the Carolina Chickadee's song – a fee bee fee bay which descends at the end. The Black-capped Chickadee sings a slower, two-note fee bee. Profile by Vicki Stittleburg: Named by John James Audubon while he was in South Carolina, the Carolina Chickadee is a small songbird with a black cap and bib separated by white cheeks. The back, wings, and tail are gray and the underparts are whitish with pale pink flanks. Carolina Chickadees are very common in woodlands and wooded urban areas of Houston throughout the year. Their diet is primarily insects, supplemented especially in winter with seeds and berries; they readily visit bird feeders for sunflower seeds. Named for their calls, Carolina Chickadees give a rapid chick-a-dee-dee-dee. They use the calls to convey information about the degree of threat posed by avian predators. Larger, lower-threat predators like a Red-tailed hawk, elicit calls with significantly more introductory ‘chick’ notes and fewer ‘dee’ notes, whereas smaller, higher-threat predators such as an Eastern screech-owl elicit calls with few or no ‘chick’ notes and significantly more ‘dee’ notes.Their song is a four note whistle, fee-bee fee-bay. Outside of breeding season, chickadees join the company of foraging mixed-species flocks that contain Downy Woodpeckers, Tufted Titmice, Ruby-crowned Kinglets, and several warblers. Look and listen for these tiny acrobatic and inquisitive birds in forested areas or urban and suburban yards or parks with large trees.